This week I began serving full time at my church in Statesville. As much as I love sitting in a classroom during the academic year, I look forward to the summer months for the experience of truly being able to practice presence with the congregation God has called me to serve. For example, so much can happen between Monday and Wednesday that I feel I have to play catch-up when I come back after being away for just a couple of days. When attending classes, I feel as if I exist in a perpetual “half-life” state of not being able to give myself fully to either the church or academia. While I might have become proficient at this it’s not a desired state. Doing life with people is a day in day out commitment and the summer months allow me to flesh out what this actually means in a practical sense. This past Tuesday, I got to observe and participate first hand in what this looks like. In the two years I’ve served in Statesville I have seen the community come together and express concern about a number of issues. Be it the opinions on the removal of Confederate statutes or the issue of gun violence, local news sources have shown the people of Statesville are ready to discuss these hard issues. Simultaneously, this community wants to celebrate who they are (as seen in this UNC-TV spotlight) while looking to the future with a hopeful vision of who they could be. 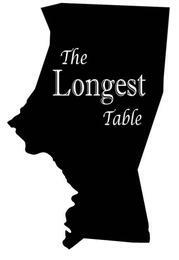 The “Longest Table” event put on by the United Way of Iredell was a step in helping facilitate conversation around these topics. This represented about half of the tables set up for the event. Participants were encouraged to write down ideas/thoughts on the heavy brown paper that acted as table cloth. 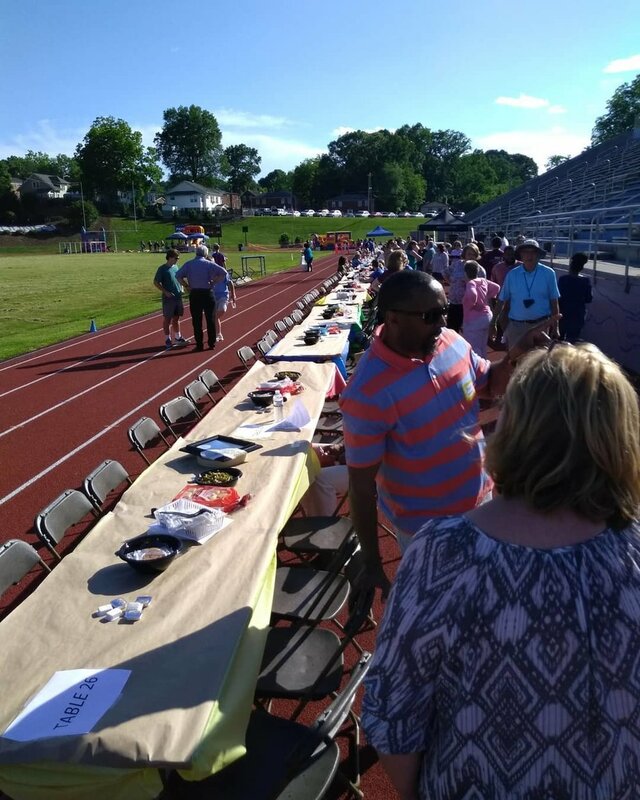 People from different walks of life, including ethnic and social economic backgrounds, came together at Statesville High School’s football field to share a meal and get to know one another. Around 600 people came out and I was fortunate enough to be a facilitator at my assigned table. I was instructed to pose two questions to those around me; what do you enjoy about our community and what and where do you want to see changes made? As local city official served the meal, the participants expressed their love for the downtown revival Statesville is experiencing currently and how the community was made of “real” people who you knew. For example, two of the people at my table had close connections with one another. When young lady informed the man across from her that she believed he worked with her father, and he responded with “Oh, yeah sure do. That must make your granddaddy…” In Statesville, at least to some degree, you don’t have to play “six steps of separation” to find out how you know the person across from you. The small town feel of “everybody knows everybody” seems alive and well. While I didn’t have any youth age participants at my table, the people I did have expressed the lack of activities for young people to take part in. I’ve heard this before when talking with students at my church who always seem to want to head to the neighboring city of Mooresville when it comes to doing anything. One woman spoke up during this time and confessed that while this was an issue, her teenage daughter was involved in so much already that adding another activity for her to do would prove problematic. This too I’ve seen on a weekly basis as students at my church are ushered from one extra-curricular activity to the next. Coming back home that evening I discussed with my wife, who had been there beside me along with baby Violet, how good the event felt. People “breaking bread” together and taking just a short break from their own lives to hear the stories of their neighbors was a step in the right direction. Nothing was solved that evening, no one walked away with any solutions, but people had listened to each other and that’s not a bad place to start. As a faith leader in this community, I found myself wondering what role the church has to play in this conversation. Me and fellow Wake Forest Divinity student Rev. Reginald Keitt. Reggie serves as the senior pastor at Mt. Pleasant Ame Zion Church in Statesville. Like the people of Statesville, the church has a lot of questions it needs to ask itself in order to make this happen. Getting outside of the institutional walls and joining our larger communities at "the table" is what our faith compels us to do. It was a reminder for me to act on that conviction. Let it be a reminder for you as well.